These blog posts have been spending quite a lot of time down here in the valley, so I think it's time to head north to the hills and share a little about my childhood home - McPherson County. The following was an essay done for school credit by John Kramer. 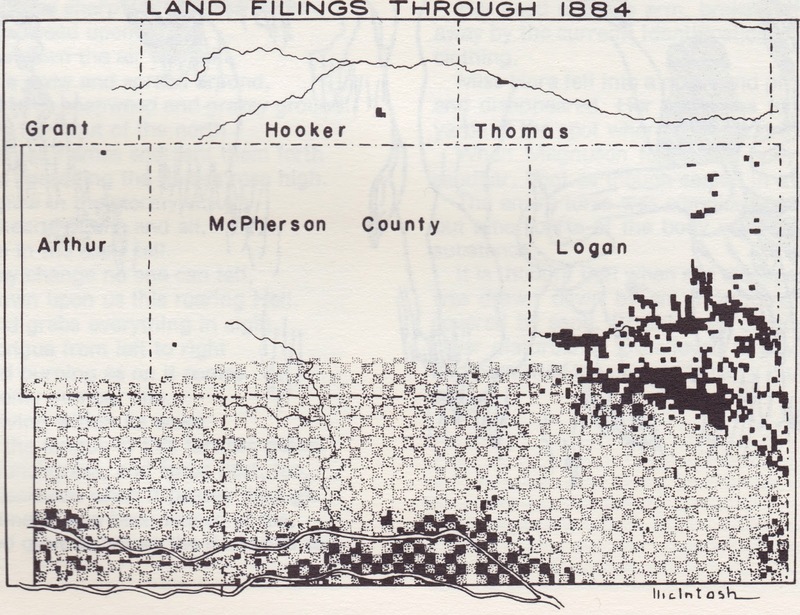 McPherson County has, in its long past, taken on many shapes. Before the Tertiary period, the area was covered several times by ocean waters. These waters deposited sediments that formed thick layers of sandstone, shale and limestone. It was during the Tertiary period that a layer of gravel, sands and silts was washed from the Rocky Mountains onto this area. Today these deposits of gravel, sands and silts are known as the Ogallala formation and are covered by a few to several hundred feet of eolian sand of unknown origin. In more recent times the continual blowing of the wind has formed the many hills that dominate the landscape of McPherson County. Also through the years the layers of sand and gravel have formed a type of natural “sponge” that gives the residents of the county today an abundant supply of underground water. The first human beings to come into this area were the Indians. They were hunters and found life good in this area because of the abundance of game. 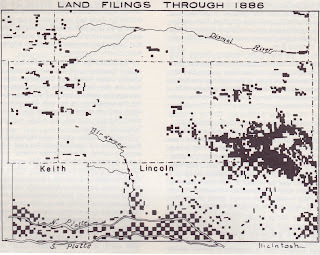 As the white man came west the Indians used the entire Sandhill area as a place of refuge from the horse soldiers of Fort Robinson, Fort McPherson, and Fort Kearney. The Indians were reluctant to leave this area but by the 1880’s all had been removed to reservations. The first white men to set foot in this country were the buffalo hunters. 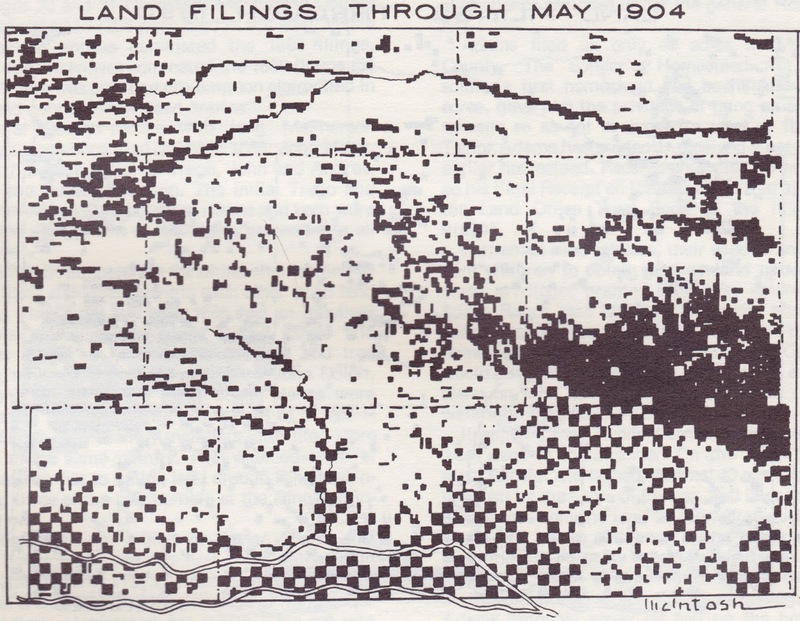 Due to the great danger presented by the Indian hunting parties, they traveled only at night when they could locate the Indian camps by the glow of their campfires. By day they camped in deep pockets and posted sentries to warn of the approach of any Indians. The wild horse hunters came next and caught many of the bands of horses roaming over the county. Two brothers, Cap and Dan Haskell, from Custer County were the most noted horse hunters who operated in this county. They caught hundreds of horses in the late 1870’s and early 1880’s and later established a ranch, the forerunner of the present day Milldale Land and Cattle Company. The first cattlemen to come to this country arrived in 1874. John Bratt and Company, better known as the Circle Outfit, ranged cattle on the Birdwood Creek north to what is now Hyannis. They established several camps, the Tin Camp on the Birdwood Creek and Mile Camp south of Baldy Hill being the most used. William F. “Buffalo Bill” Cody, Colonel Frank and Captain Luther North in 1877 established their “Wild Horse” ranch. 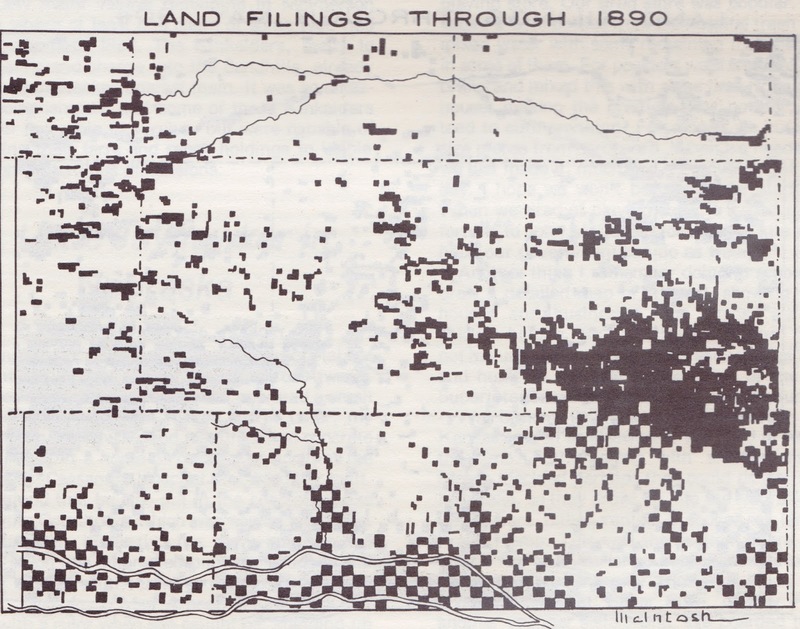 It was located in Cody Lake valley, but the cattle were ranged east and south to the headwaters of the South Loup River. These two ranches spread until the whole county was being grazed by their cattle before the coming of the settlers in the 1880’s. 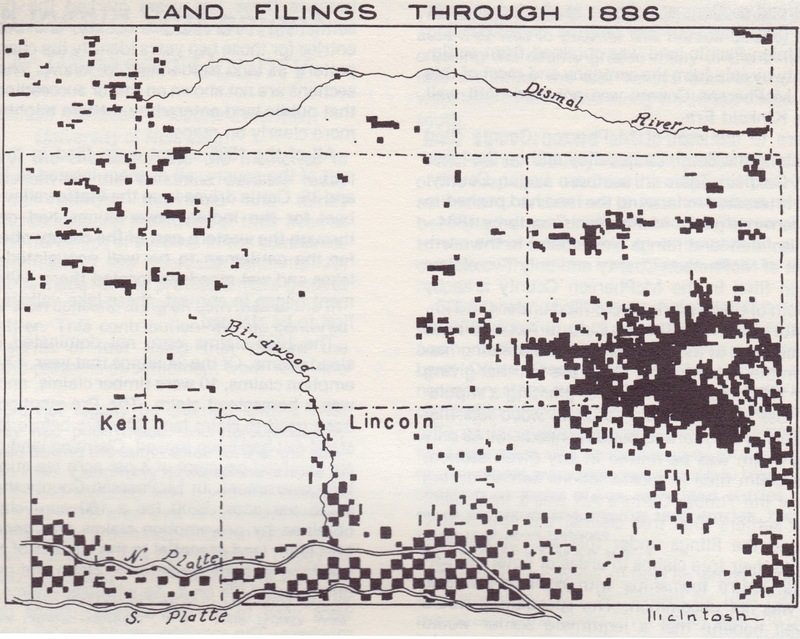 The Burlington Railroad made a survey for the Kearney-Blackhills railway through this area in the 1880’s. It was this that brought the settlers into this area. They settled along the survey route expecting the road to be built. The road was built to Callaway by 1890, but the route through this area was abandoned and the road went north through the Middle Loup valley. 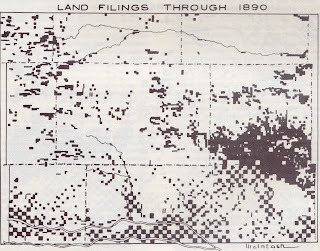 The settlers who came to this area followed these surveys and the trails made by early cattlemen and horse hunters. They settled in the broader valleys on the more fertile soil. 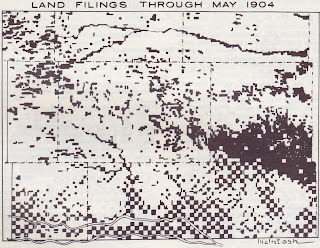 Note the checkerboard pattern that shows the land granted to the Union Pacific Railroad. Among the first permanent settlers were Mr. and Mrs. John Quinn, who located on the Cody-North ranch in 1884. Cap Haskell, the horse hunter established a ranch which was the forerunner of the present day Whitewater ranch. Nate Trego, John Schick and Jack Rupp, who were cowboys for John Bratt and Company, also settled in the western part of McPherson County. Others who settled in the western part were Malam, Ed, Ell, Nate and John Bassett, Milt Hogue, Frank, Allen and Bill Terrell. Some of the early settlers in the central part of the county were John Booze, John L. Neal and sons Lew, Elmer and Billy; Hugh Bedell, Mike Connell, Jay Smith, Ernest and Owen Wisner, Phil and Joe Suiter, Manley Calhoun, Bill Foster, Link Sells, the Miller family, Johnny Clouse, Frank and Charley Dolph and Bob Shimmin. The earliest settler in the eastern part of the county was George Brooks. Other early settlers in this community were Jake Leak, Silas Clothier and Gilson James.